So you’ve found the woman you want to spend the rest of your life with. Now, how much do you plan to spend on the ring? Engagement rings come in all types, qualities, styles and price points, so the decision on what you decide to invest in, and how much it costs, is really up to you and your budget. When you’re shopping for an engagement ring, you may quickly come to realize that the diamond industry puts much pressure on men to invest in a high-quality and high-cost ring for their bride-to-be. In fact, the general rule of thumb is that you should expect to spend about two months salary on the ring. That means if you earn$3,000 a month, you would want to look for engagement rings in the $6,000 range. But in this tight economy, many couples are better off sticking with a less costly engagement ring and investing their money on a down payment for a house or putting it into their retirement fund so it will be there later in life when they need it. Regardless of how much you plan to invest in an engagement ring, before you begin to look at your options, it’s important to be educated so you can make sure you are getting a reasonable deal. There are four basic factors that affect the cost of an engagement ring. These are often referred to as the “4 C’s.” You’ll need to take these variables into account when deciding whether a ring you’re considering is fairly priced. This is the measure of how much the diamond weighs. The heavier the diamond, the higher the cost. Many people feel that a 1-carat ring is a pretty reasonable standard, but some men purchase much smaller diamonds, or much larger, so the size can be whatever you want. How perfect the diamond is also affects the cost. Cloudy diamonds or those with small flaws are less expensive. Keep in mind that most flaws only show under the microscope. In fact, they are graded under 10 X magnification, so often they won’t even appear to the naked eye. Therefore, getting a less-than perfect diamond is a good way to afford a larger size stone without going broke. The whiter a diamond is, the more it will cost. It’s important to understand that completely white/colorless diamonds are very rare and therefore very expensive. A little bit of tint or color in a diamond won’t mar the beauty, though. In fact, like most flaws, a hint of color is usually not noticeable to the naked eye and can help make a ring a bit more affordable. Fancy color diamonds, such as yellow and black, also exist in their natural state but these are also extremely rare and therefore can also be quite expensive. The shape of the diamond also affects the price. The more complicated the cut, the more labor involved, so you can expect the ring to be priced accordingly. Diamond shapes like pear and hearts are more time intensive and therefore more expensive, while simpler cuts like emerald and solitaire can be more common and can save you a little on the cost. In addition to the “4-C’s” listed above, there are a few other details that can affect the price of an engagement ring. For instance, the type of setting can make a big difference. Platinum is the most expensive metal and is usually used with high-quality diamonds. This has a whitish silver look. You can also opt for 18 karat gold, which is a little deeper yellow than 14 karat, or rose gold, which has a pinker hue. Or, you can select either 14 or 18-karat white gold, which has a silver-colored tone. So does titanium, which has been gaining popularity in recent years. Any of the white-colored metals are a good choice for someone with very traditional or who wears a lot of silver jewelry. Other variables that will affect the look and cost of the engagement ring include the style of the setting itself, such as the band’s width, texture and design, and how the stone or stones will be set in the band. Some engagement rings have the stones set right into the metal, while others have the stones held in low or high prongs that raise it up from the band. You should make these decisions based on your fiancé’s taste and style. One of the most common engagement ring styles today is a simple solitaire (round) style diamond set in white or gold. But some women don’t want to follow the crowd and would prefer that their engagement ring be unique. If your fiancé has her own sense of style, you might consider purchasing an engagement ring with an emerald, sapphire, colored diamond, or even just a simple modern band with no stone. Some of these alternatives can be as striking as a diamond and even more personal. They can also be much more affordable as well, depending on the stone. To help you find something your mate will like, you should pay attention to the type of other jewelry she wears. Does she wear simple sterling silver pieces or more ornate antique styles? And how does she dress? Is her clothing classic or does she prefer cutting edge fashion? The answers to these types of questions can help you determine what type of engagement ring she will want to wear for many years. If you’re not sure of what your fiancé will like, your best bet is to shop with her so she can pick her engagement ring, or at least make some suggestions to guide you. If you really want to surprise her, you could ask her family or a few of her close friends to give you some advice on what style to buy. You can find engagement rings in any jewelry store that sells quality merchandise. Just be sure they are well-respected and are in good standing with the better business bureau . Of course, you can never go wrong with Tiffanys. After all, what woman wouldn’t love getting their engagement ring in the trademark robin’s egg blue box? But you can expect to pay more for the name, so you may also want to explore some of the other options. For instance, you can also shop at any of the chain jewelry stores you can find in most areas, like Zales, Jared the Galleria of Jewelry, Kay Jewelers, Gordons Jewelers, and Helzberg Diamonds. You can shop for an engagement ring in person in the stores, or browse online. There are also a number of other online retailers that sell fine jewelry, including Ebay, Overstock.com, Amazon, and Ross-Simons. If you have an engagement ring that’s been passed through the generations of your family, your future bride may greatly appreciate being next in line. But even if there’s no family heirloom to give your bride, you can invest in an antique or vintage engagement ring you find online or in a high-end antique store in your area. The classic settings and high quality of older engagement rings can make them quite desirable. You can find them on online auction sites and in pawn shops, too. Just always make sure you know that you’re getting a high-quality diamond worth the price. When purchasing a diamond engagement ring, if you’ll want to be sure that the quality of what you select is certified by one of the respected gemological institutes, including the Gemological Institute of America, the HRD Antwerp Institute of Gemmology and the International Gemological Institute . Certification by one of these institutes will ensure you are really getting what the jeweler describes. Since many manufactured stones today can easily be passed of as natural diamonds to the untrained eye, you don’t want to take any chances. What you will spend on your fiancé’s engagement ring is really up to you. The quality of the stone you desire, including those “4 C’s,” will greatly affect what the cost will be. If you compare stones of the same caliber, the bigger the carat weight, the higher the price will be. The average price per carat varies depending on the market but if you assume a 1 carat ring is the average and want to know how much larger you might go, you can estimate that for every additional carat size you increase, the price will go up about $1,000. So if a 1-carat engagement ring you like is $3,000, then going up to a similar diamond of 2 carats will be about $4,000, or 3-carats will be $5,000. 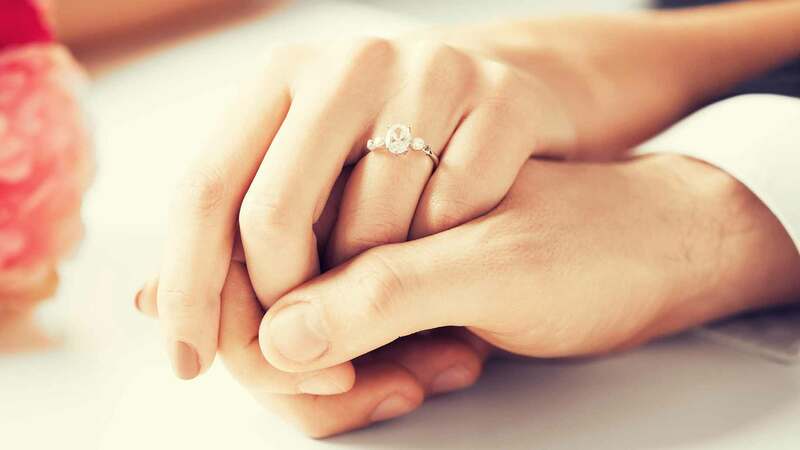 If money is tight or your fiancé doesn’t care much for jewelry, you may decide to keep things very simple and buy a ring with tiny diamond chips or semi-precious gemstones. At this low end of the spectrum, you can expect to get up to about ¼ to ½ carat total weight of lower-quality diamonds in the $500 to $1,000 range. If you have put a little more money into the purchase, in the $1,000 to $2,000range you can expect to get a higher quality engagement ring with up to about ¾ carat total weight. Many men spend between $2,000 and $5,000 on an engagement ring, which is a reasonable price for a ring with about 1-carat total weight or more, depending on the stone’s quality and where you buy it. At the lower end of the price range, you will have your pick of metal settings. You can also select rings with a mixture of diamond and colored gemstones or even design your own engagement ring without needing to spend more. On the higher end of the range, you can find modest Tiffany engagement rings or larger stones. Most diamonds in this price span will be certified. Of course some men spend even more, though, either because they can afford it or because they want to spoil their intended and don’t mind paying off this purchase for a while. In the $5,000 to $20,000 price range, you can get some real eye-catching bling. You might opt for a 3 or 4-carat very high-quality engagement ring or select a diamond flanked by emeralds or other high-quality gems. You might also select a design that incorporates several large diamonds or a large diamond with smaller accent ones. Many stores offer financing options for large purchases, which will allow you to get more extravagant. You can also pay at most jewelers with a major credit card. Keep in mind that these will be require monthly payments and could be charged at a very high interest rate, though, so it will affect the overall purchase price of the engagement ring in the end. While most women will be happy to have a lovely engagement ring, regardless of the size and value it holds, one lucky woman received the most expensive engagement ring in the world, which is reputed to be a De Beers diamond totaling 9 carats set in platinum. It’s valued at $1.83 million.